FREE 2-DAY SHIPPING: Must log in or register on the My Account / Sign In page and select “Standard” or “2-Day Shipping” shipping method at Checkout to redeem this offer. Shipping Discount will be applied at Checkout. Free shipping offers valid only during your period of eligibility for Noir List or Elite List status. Valid online only at GUESS.com, GUESS.ca, Marciano.com, ShopMarciano.ca, GUESSFactory.com, GUESSFactory.ca, GbyGUESS.com and GbyGUESS.ca within the contiguous United States (excludes Hawaii, Alaska and U.S. territories) for both “Standard” or “2-Day Shipping” and Canada only for “Standard” shipping. For “2-Day Shipping”, offer only applies to select styles online and orders must be placed Monday through Friday before 2:00 p.m. PT to be shipped the same day. Packages will be shipped and delivered Monday - Friday (excluding holidays). Orders placed after 2:00 p.m. PT on Friday or any time on Saturday and Sunday do not ship until the following Monday. No adjustments will be made on prior purchases. GUESS?, Inc. reserves the right to extend, modify or discontinue this offer at any time without notice. REWARDS: *Reward redeemable at participating GUESS, GUESS Accessories, Marciano, GUESS Factory, GUESS Factory Accessories, and G by GUESS stores in the United States and Canada, and online at GUESS.com, GUESS.ca, Marciano.com, ShopMarciano.ca, GUESSFactory.com, GbyGUESS.com and GbyGUESS.ca. Limit one offer per member. 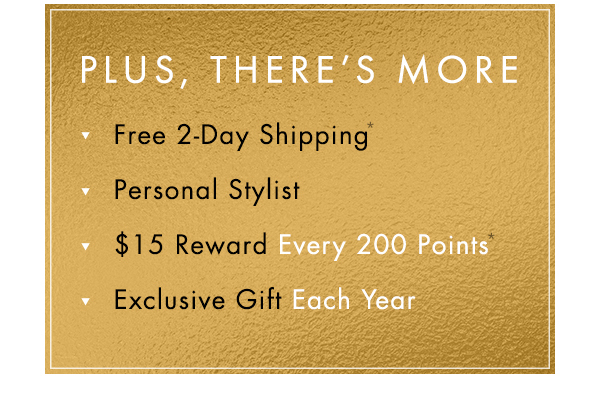 Must be a GUESS List Noir member to take advantage of this offer. Reward automatically loaded to GUESS List Noir card. Online customers -log in to your GUESS List account prior to checkout to redeem; in-store customers - present your GUESS List Noir card at checkout to redeem. Offer not valid on prior purchases, or the purchase of gift cards or Gc Timepieces. Subject to program Terms and Conditions. GUESS?, Inc. reserves the right to extend, modify or discontinue this offer at any time without notice. 30% OFF: *Certain restrictions apply. Void where prohibited or taxed. Offer valid only at participating GUESS, GUESS Accessories, Marciano, GUESS Factory, GUESS Factory Accessories and GBG stores in US and Canada and online at GUESS.com, GUESS.ca, Marciano.com, ShopMarciano.ca, GUESSFactory.com, GUESSFactory.ca, GbyGUESS.com and GbyGUESS.ca from August 1, 2018 through February 28, 2019. Limit one offer for one-time use per customer. Must be a GUESS List Elite member in good standings to take advantage of this offer. Discount applies to a purchase of non-excludable merchandise. Offer is not transferrable. Must be intended recipient of this coupon to take advantage of this offer. Discount not valid on purchases of special collections and collaborations, GUESS Originals, watches, Gc Timepieces, GUESS Connect, clearance, gift cards or previously purchased merchandise. Cannot be combined with any other coupon or offer. Discount taken before taxes and shipping (if applicable). To redeem offer: Online customers – log in to your account prior to checkout and enter the online promo code at checkout; in-store customers – present this coupon at checkout. Subject to program Terms and Conditions. GUESS?, Inc. reserves the right to extend, modify or discontinue this offer at any time without notice.